Dean was part of my final send out from 2010. I did not do any mailings in November or December of 2010 as I was planning to graduate and needed to concentrate on school. Waxing nostalgically, (- as I do frequently on this site,) I can’t help but think what was on my mind that day about my future about me now in the current present. It’s a tad depressing really, but eventually I’ll work my way out of this. Sometimes you have to fall down a crevasse to work your way out in life. 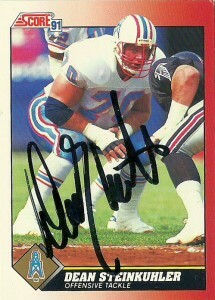 Dean was a member of the Oilers powerful offensive line during the 80s and very early 90s. 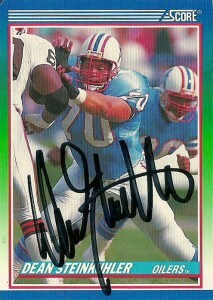 He would be the 3rd and final drafted offensive cog of a dominant line that included Mike Munchak and Bruce Matthews. Often overlooked, by his more glamorous counterparts- if you can call an offensive lineman that, -Steinkuhler was both equally dominant as both a drive blocker and pulling on sweeps. 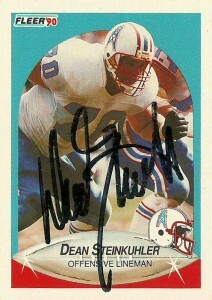 When the Oilers ran the option (in those frightening days with Warren Moon running the ball in the 80s,) you would always see Dean out there opening up holes and leading the way. He was never named to the Pro Bowl, which was a shame, because when injuries finally claimed Dean’s playing career in the early 1990s, it was the first noticible chip in the Oilers offensive armor. I gave up on getting this one back since I sent for him last year after seeing a rash of signatures on SportsCollectors.net. Just recently I saw another success and thought that perhaps these cards would make their way back to me, and amazingly they did in a brisk 383 days.